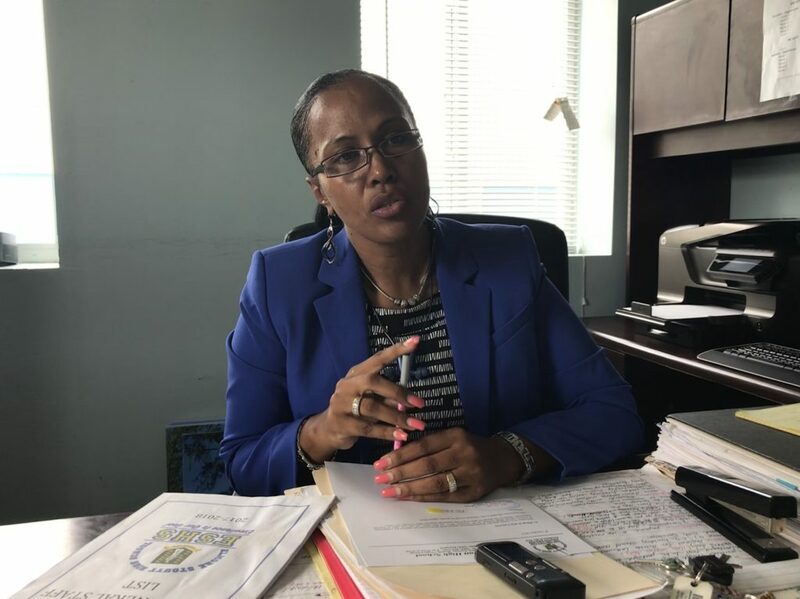 Principal of Elmore Stoutt High School (ESHS) Sandy Underhill has called on businesses to emulate the Tortola Pier Park by enforcing policies to curb public displays of student indiscipline. She also wants parents to be more responsible where their children are concerned. Underhill’s comments come at a time when ESHS students have been involved in a series of public fights and unruly behaviour. Their behaviour has been affecting local businesses such as TICO, RiteWay, Island Paints and Island Services, which are all located in the vicinity of the temporary ESHS facility in Pasea Estate. “They (the businesses) are not happy,” Underhill said. However, Underhill said the school cannot be solely responsible for student unruliness. The ESHS principal said fights are inevitable with a student population that exceeds 1,000. “Because of the size of the school, fights are going to happen. We don’t want them to happen but fights are going to happen,” she reasoned. Underhill also said it is challenging to police students consistently since the school is operating on two shifts. The early shift ends at midday while the second shift begins at 1pm and ends at 5pm. “We don’t have time to run down and police people children at 12pm. But if people cared and showed gratitude for the hard work that you did, they would come and pick up their children at 12pm and make sure that they weren’t getting into fights. Or put something in place to ensure that your children weren’t being a nuisance to everybody else,” the principal reasoned. In the meantime, Underhill said the school continues to shine academically and otherwise. “Everybody looks at it like [fights] are the only things that happens at ESHS and that is far from the truth. I think our public is misled by what goes on in school,” she said. Do we know how long it will be before the main building at ESHS will be repaired and the children can go back? Dem waiting on voluntary workers !!! Will there be an honor roll program this year? That would be a great way of highlighting the positives of the school and rewarding those who did well last year. One of the reason why some businesses will not implement such policies is because of the spending power the children represent. When they started keeping the children on campus during lunch time many businesses suffered. Two businesses that are happy they came are RTW and Sports Club. They might be a nuisance sometimes but they help pay the bills big time. In essence they should be allowed to run wild and cause havoc because they “help pay the bills big time”. Those hanging outside RTW stores drinking dollar beers are also helping to pay the bills. I am a frequent traveler and nowhere have I seen this type of behavior. It is so distasteful. I hate going to some stores because of this, as it makes me uncomfortable. Suggestion. Have the Upper School classes in the morning starting a little earlier,since they are better behaved and the Lower School in the afternoon. Maybe 12.30-4.30pm. The Lower school students won’t have time to loiter around town all day. Rite Way you are selling food. Set up a food stall on the outside in some one of the parking lots for the children to purchase their lunch and make it clear that they should not go into the store at lunch time. Ms.Underhill school children were not this unruly under the leadership of Mr. Stoutt. No further comments needed read between the lines. What you wrote shows your mentality and ignorance. I am not saying Mr. Stoutt was not a good principal but I seem to recall students attacking him at some point. Ms. Underhill is doing the best she can with the rude, disrespectful and unruly children the parents are raising or rather, not raising. If you want to blame anyone, start with the parents. And while you’re at it, check yourself.